Last year my son asked for a Mickey Mouse Clubhouse cake for his birthday party. 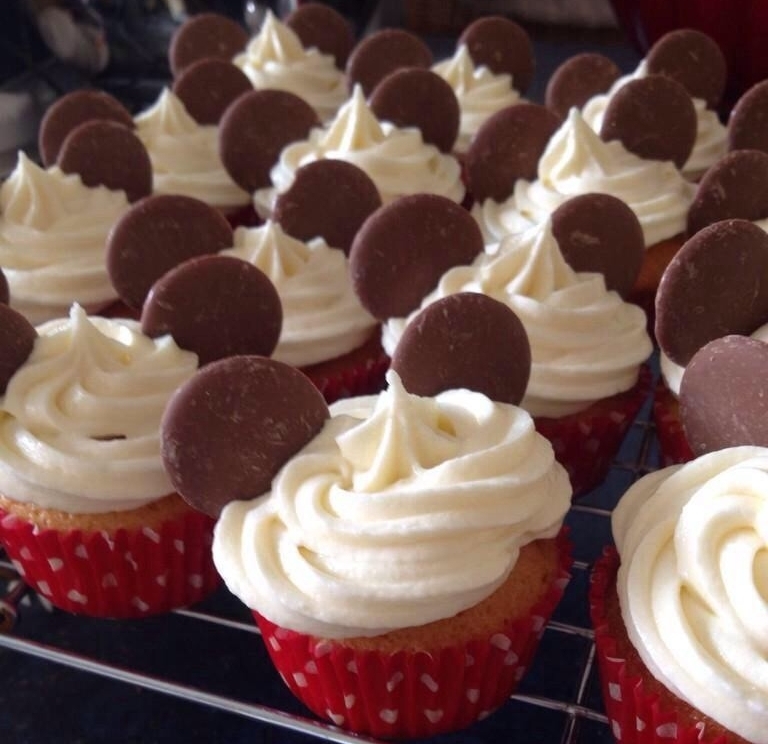 After I made the cake I also made some easy peasy Mickey Mouse Ears cupcakes. All you need is cupcakes, frosting, a star piping nozzle and chocolate buttons. Using red and white spotty cupcake cases also helps stick with the Mickey Mouse theme. To make Minnie Mouse cupcakes use Pink and white spotty cases instead and add a bow made of fondant icing between the ears. Although I made these for my son’s party they would also be a perfect idea for children to do themselves. Just watch them to make sure most of the buttons make it onto the cakes! Vanilla cupcakes topped with vanilla frosting and chocolate buttons. In a freestanding mixer cream the softened butter and sugar until smooth. Add the vanilla essence to the beaten egg then slowly add the mixture to the mixer. Gradually add the flour while mixing on a slow speed. Add the whole milk slowly while mixing by hand until the mixture falls easily from a spoon or spatula. Set out the paper cupcake cases in cupcake tins and add the mixture. Cream the butter and icing sugar in a free-standing mixer on a low speed it will initally look powdery before becoming a smooth mixture. Mix the vanilla essence with the milk in a separate glass or jug (I use a re-purposed Tommy Tippee cup as it has handy volumes on the side). With the mixture on a low speed slowly add the vanilla milk. Beat the mixture on a high speed for at least 5 minutes. Place the frosting in a piping bag with a star nozzel. Pipe the frosting onto each cupcake starting at the outside of the cake and spiraling towards the centre to make a swirl. Add two chocolate buttons to each cupcake to make the ears.